With Quentin announcing that he is still planning on only making 10 movies, there is not much time left before he is done. With eight movies under his belt (Both Kill Bill films counting as one), fans are eagerly expecting and waiting for his last two films. So I though that since I have watched every Quentin movie (aside from Jackie Brown), I would list them off in how I enjoy them, from worst to best. Without further ado, here is my ranking for all of Tarantino's movies, excluding Jackie Brown. In my honest opinion, Death Proof is Quentin's weakest film. Although it is the most experimental I have ever seen Tarantino be in any of his films, it did not help this film much. The film did have some good elements to it though. Russell's performance along with the ending were things to note. Furthermore, I enjoyed how Quentin used this film to challenge usual slasher film structures and tropes. However, the film overall felt very careless and half-assed. It felt like it was missing something that is quintessential in other Tarintino films yet I can't seem to put my finger on it. Overall, I do not recommend this film unless you are trying to have a full picture of Quentin's career so far. Kill Bill: Vol.2 unfortunately did not sit well with me. I remember putting off the first Kill Bill for a very long time for some reason. When I finally got around to watching it, I couldn't wait to finish up the story of these interesting characters and see how everything unfolds. However, I was disappointed with what I got. The sequel lacked the charm that the first had already built up. The sequel just dragged on and focused less on the bride and more on meaningless conversations between the other side characters. The first film really put us in the shoes of the bride and we were following her in this journey of revenge. The sequel basically threw all of that away and started to go around and try to ram in enough backstory for all of the other side characters presented in this film. The ending as well made me feel a bit dissatisfied because it was not the end I imagined when I saw the first film. All in all, I feel like I might have enjoyed this film if it wasn't associated with its prequel. However, since they are connected, I am judging the sequel the way it should be, as a continuation of the first story and how effectively it is able to continue on the story. For me personally, I did not enjoy the direction the second movie went towards and hope if there will ever be a third one, it would follow the style of the first film and not this one. By no means is Django Unchained a bad movie, however when you put it against all of the other Tarantino films, this is where I feel it sits. The film manages to offer the usual Tarantino style but in a western setting for the first time. 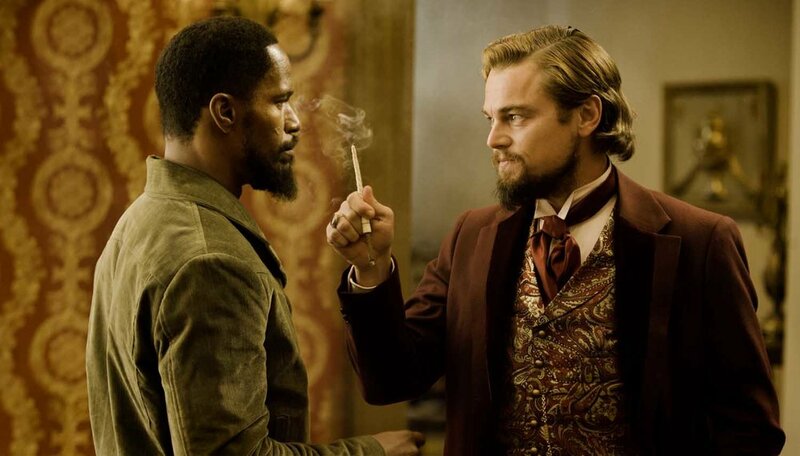 Tarantino also manages to tackle very challenging issues such as slavery and racism very effectively. The film manages to bring up questions for the audience, and Quentin never tries to sugar coat anything or go easy on the audience. Furthermore, performances by Christoph Waltz and Leonardo DiCaprio were one of the most memorable I have seen in Quentin films. However, the main reason the film falls in this spot for me is poor use of time along with the story structure. The film is one of the longer Tarantino films and it fails to adequately fill in the time with interesting and dynamic scenes and dialogue. The first half specifically felt a bit messy as the story feels all over the place and never settles into one idea or point. This confusion causes a disconnect with the audience as they start to feel confused as to what they should focus on. However, the film thankfully does justice in the second half as it is more focused and able to efficiently convey the various plot points and themes that Quentin wanted to show. All in all, Django is a great film, however the lack of structure in the first half along with some dull moments placed it in this spot for me personally. Inglorious Basterds in my opinion marked a very important step for Tarantino. It was when he decided to go out of his comfort zone and create something from a different era, time, and setting. This is film was basically the tipping point for his next couple of films, to allow him to open up more and explore different types of films. Before this, all of his films had a very modern city setting. 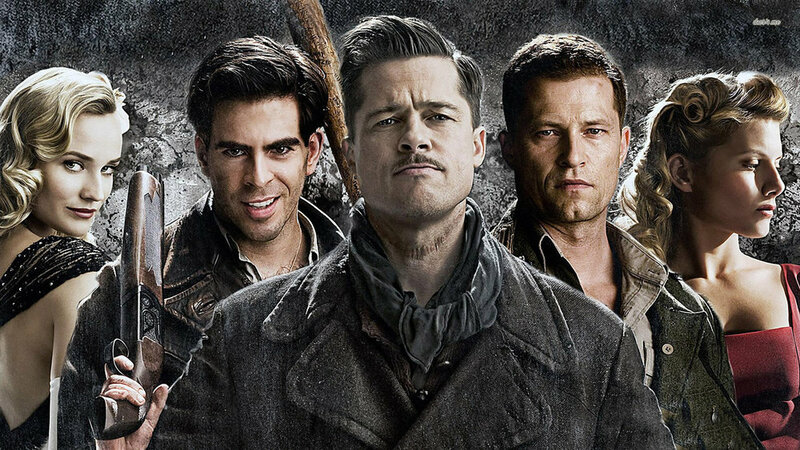 With Inglorious Basterds, he was entering new territory. Now, I do understand that many people do not enjoy this film as much as his other works, however I feel like this film offers much more than what it shows on the surface. The feel of the film along with the incredible camera work really put you into the world of these characters. We feel like we are in the time of the second world war. Not only that, we get the usual incredibly written and unique characters that Quentin always offers. This film also marks the first time we see Christoph Waltz and Tarantino working together. The first scene which introduces Colonel Hans Landa is one of the best introductions to a character we have ever seen in a Tarantino film. That simple scene in the farm told us so much about the character, how he operates, and how he thinks. Furthermore, Waltz did not disappoint by giving us a great performance which ultimately led him to his first Oscar win. Not only Waltz, but Eli Roth, Dianne Kruger, and especially Brad Pitt gave us stellar performances in this film. Furthermore, the film had one thing that I really enjoy in Quentin films, memorable scenes of dialogue. The scene in the bar underground is in my top favorite scenes of any Tarantino film. The entire scene, the way its shot, the dialogue, and the tension all play beautifully together. Furthermore, the scene with Hans Landa and Brad Pitt's character negotiating come to mind, as well as the opening farm scene which I already discussed. Finally, the film also comes to such a satisfying ending that I could not help but smile every time I watch it. All in all, although Inglorious Basterds is not one of Tarantino's most critically acclaimed films, I do believe the film is special in what it manages to do. I also believe that the film acts as an important tipping point in the career of Quentin Tarantino, and I am really glad he took the risk with it. If I were to make this list a couple of years ago, I would have definitely placed both Kill Bill films at the bottom of the list. However, as years go by, my appreciation for the first film of the franchise keeps on growing. I remember first watching it and thinking it was a very basic action film. As years went by and I as I started to randomly watch the film on TV as I was flipping through the channels, I realized how naive I was. I had not realized till later on in my life how innovative this film was, in terms of structure, character development, and even action. The way the film begins was such an interesting way to start off a film like this. A random house visit turns to a one of the bloody and violent fights you will ever see inside of an average suburban home. The audience is pushed aback and filled with so many questions. What is happening? Who do we root for? Is she bad? Is she good? Why is she angry? So many questions are floating so quickly and that is the beauty of this opening. It manages to keep the audience interested by just one scene. If the movie were to be placed in chronological order it wouldn't nearly have the same affect that the current iteration has. Furthermore, the way that Quentin built up the characters along with their backstories really grabbed my attention. I wanted to know more about the world of The Bride and these enemies that she wishes to take revenge on. The various techniques of experimentation that Quentin used fit beautifully into the world of Kill Bill such as the anime sequence. Also let us not forget about the lengthy fight scene at the dojo. It is hard enough to make an action scene with many people in it. Yet Tarantino managed to have this memorable scene where each death is more remarkable than the other. The camera work along with the editing also played a key role in maintaining the uniqueness of the action in this film and dojo scene specifically. All in all, although I initially brushed off Kill Bill, I now see how important it was for action films and how innovative Tarantino was with this film. The latest film by Tarantino is unfortunately one of his least grossing and lowest rated films in the past couple of years. Which is baffling to me because I absolutely loved this film. I feel like it is one of his most finest works and every element in this film is crafted so carefully and so methodically that its hard to not appreciate it. The Hateful Eight is basically what would happen if Quentin Tarantino adapted an Agatha Christie book. This is the first and might be only time we see Quentin taking this style of storytelling. Confined to one cabin for most of the film, Quentin tackles a murder mystery in 2015, something we usually don't see at this day and age. What I also really enjoyed in this film was that Quentin decided to shoot it in 70mm. Which is definitely strange because this is not the type of film that you would usually see in 70mm, it is more for big open and epic films. However, Tarantino was able to utilize this small cabin so effectively and really bring out every bit of the cabin he could with his brilliant camera work. Furthermore, in my opinion the best aspect of this film is characters. Obviously Quentin's biggest strength is creating interesting characters along with his writing. However, to me personally, this film has the best overall characters since Pulp Fiction. Every single character in this film is memorable, and that basically is because of the way the film is structured. Nevertheless, every character was amazing, and the subsequent actors played their roles beautifully. Aside from the characters, the dialogue was engaging as always yet in this film it was more than that. Since the film heavily relies on dialogue and speech, since the characters have no where to go, Quentin took extra care to have such a unique and dynamic script. After watching interviews I learned that he actually wrote the whole script three times, and it was the first time he ever did anything of the sort. The stories that were told were memorable, and the dialogue never felt boring or dull even with the lack of setting change. Moving along, the music as well in this film is my favorite score from any Tarantino movie. It is also great that Ennio Morricone, the composer of the film, got his first ever Oscar, after composing for over 500 films, for The Hateful Eight. The film oozes charm, and every element plays a role in that charm. From the slow start, to the chilling end, this is a film that you may want to re-watch if you did not enjoy the first time around because I feel like it is a diamond in between all of the other gems of Tarantino films. The top two spots were so hard to place to be completely honest. If I could, I would give them both first place. However this is how I decided to finally place these two films. 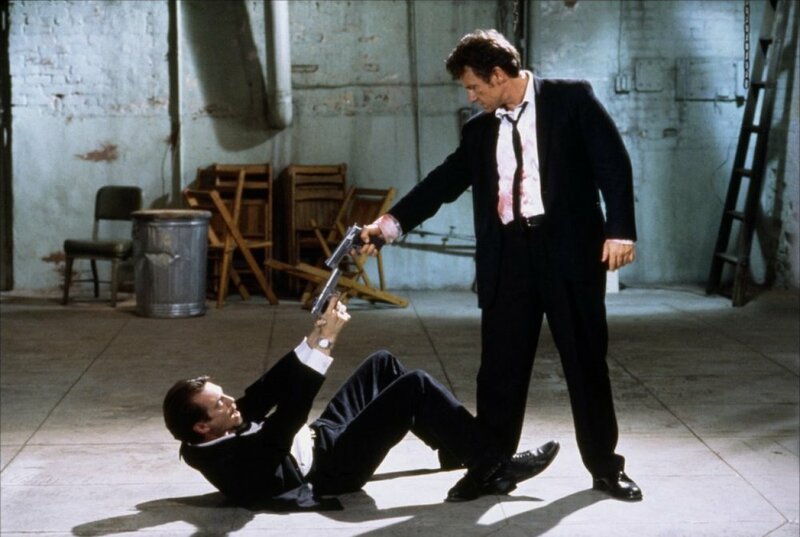 In my opinion, Reservoir Dogs is one of the best if not the best directorial debuts I have ever seen. Imagine making your first film and it comes out as this masterpiece. From the first scene at the diner, everyone watching knew that this was something special. That scene gave viewers at home the first glimpse at what it was like to see a Tarantino movie, and he would continue that style for years to come without ever feeling stale or overused. I remember the first time I watched this film, the first moment that struck me was the first scene (post intro credits). When the credits finally end and we see Tim Roth bloodied in the car screaming his lungs out, all we can do is open our eyes wide and start churning our brains. Thousands of questions start popping in our heads and we are interested, confused, amused, and many more. Quentin with this first scene showed us how he will tackle film. The unique way he told this story managed to keep the suspense and tension building up all the way through. Not only was he able to show us his interesting story structure, he was also able to give us a taste of his ability to create interesting characters. This was a very important thing in my opinion, because he showed audiences that we did not need action and events to carry a film, we could have dialogue and script do the same. Although it was his first film, Tarantino also managed to grab an incredible cast of actors to play for his film. Harvey Keitel, Tim Roth, Michael Madsen, and Steve Buscemi were all incredible and I could watch their performances in this film forever. From the incredibly witty diner scene to the ear torture scene to the chilling yet sad ending, Reservoir Dogs never misses a beat. Starting off his career with a film like this gave the viewers hope that there is much more to come. Thankfully, much more did come. Could it have been anything else? 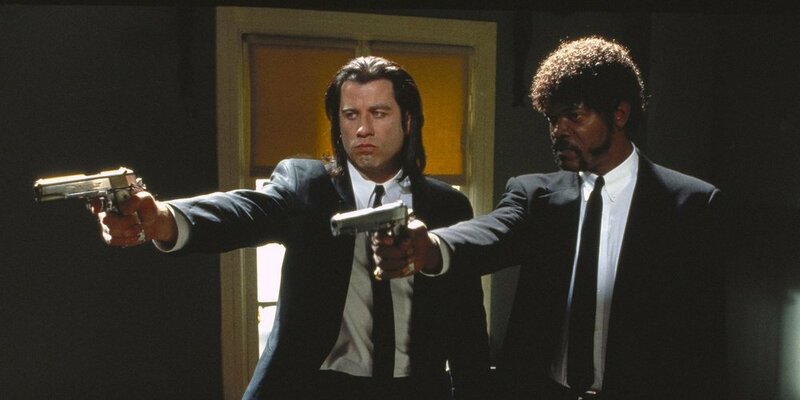 Pulp Fiction is as close to perfect as a film can get. There is literally nothing I can fault in this film. I remember back in 2010 when I had just started to appreciate film. I did not have a sense of what I liked or what was good and bad. All I did was try to watch films from every genre to try to get a sense of my taste in cinema. After trying many films and feeling hopeless I stumbled upon Pulp Fiction. At the time, I brushed it off, and kept on watching other films. When I finally got around to watching it, I kept on kicking myself for not watching it sooner. What I clearly remember was watching the sequence of Jules and Vincent going to Brett's home as they talked about quarter pounders and foot massages. As I was watching that 15 minute sequence of just talking, all I could think of was "this is it". That was the "aha" moment for me and it all clicked. This is what I was meant to appreciate in cinema and I was so thrilled to find out more. This is why Pulp Fiction is in my top spot, it was one of the key films early on in my movie obsession that shaped my current taste in films. Obviously that is not the only reason the film is in this spot. The film is flawless. The group of characters in this film is one of the best if not the best cast of characters I have ever seen in a film. The way they all play off of each other and how they interact just adds to how incredible it made the film. Not to mention the killer acting from Tim Roth, Samuel L Jackson, John Travolta, Bruce Willis, Ving Rhames, and many more. Everything just fit in perfectly. Furthermore, the script to this film is my favorite script in any film ever made in history. It manages to do something that so many films fail to do, which is make conversations interesting. Even when the characters aren't talking about the events of the film, we are glued to the screen. It's why to this day people talk about what they call a Quarter Pounder with cheese in France. Tarantino is able to make small talk interesting, and as if we were just listening to a group of friends chat. Moving along from the script, the story structure again was really interesting. The way that Tarantino basically sandwiched the film was one that has been done a couple of times, but never in the way that Pulp Fiction did it. The episodic nature of the film along with focusing on each character with every segment really played well with the entire structure of the film. Not only that, but Quentin kept on jumping to different times, and the audience did not to be told that. We were able to infer these aspects due to his clever use of editing along with his great story telling. All in all, I don't know what else to say about this film. It is one of my favorite films ever made and I could not recommend it enough. It is one of those films where everything just clicks, and it all flows together beautifully to create this masterpiece. Thank you Mr. Tarantino for creating this film and allowing me to continue watching films.